I live in a competitive household. Case in point, the recent CrossFit Open competition that my husband and I participated in. I won. Ahem. Cough, cough. The upcoming NHL playoffs bring out our competitive nature as well, especially since our loyalties lie on polar opposite ends of the fan spectrum. I’m from Southern Alberta, and the Flames are my team, while he’s a true-blue Leaf fan, born and raised in the GTA, where Stanley Cup parades are planned every October. Our children are not immune to this rivalry, and they’ve staunchly aligned themselves with their same-gendered parent, although my five-year-old daughter has been known to change her team weekly. Her Uncle’s influence makes her a current Oiler fan. I often joke about how my husband says the kids can “cheer for any team they like,” and then boos and moans if that team is any other than the blue and white. But the reality is, April is the best sports month of the year. The Flames have clinched, and we might have six Canadian teams lacing up in the playoffs. Let’s not forget the Raptors, who’ve also guaranteed themselves a spot in the NBA post-season. The BlueJays have just begun, it’s Master’s weekend ahead, the Boston Marathon runs on April 17th, and the NCAA basketball champion was crowned last night. Whew! ‘Tis a great time to be a sports fan. 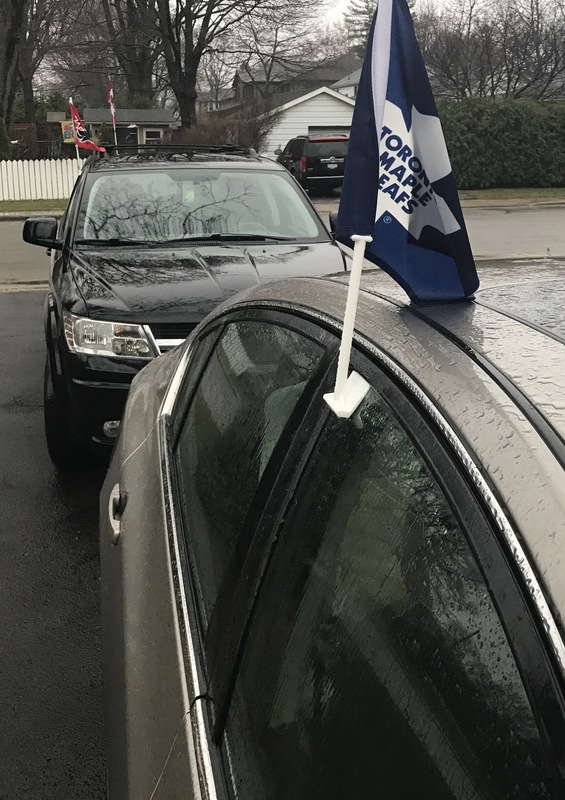 And if you need another visual, take a look at our rainy driveway this morning: a Leaf flag on his car, a Flames flag on mine. This entry was posted in Fitness, Opinion and tagged baseball, basketball, BlueJays, children, fan, Flames, hockey, Leafs, sports. Bookmark the permalink.